Yogesh Chabria - The Happionaire ​Blog - Best Motivational Speakers In India - Inspiration, Success: No Parking, Micro-finance And Guest Writers! No Parking, Micro-finance And Guest Writers! A lot has been happening. The last few days have been very busy, but at the same time have been loads of fun too. I have always enjoyed doing new things and I feel one of the best ways to stay happy is to keep yourself busy and occupied doing things you love. I will try to share some of the things that happened over the week. My car got towed a few days ago and I ended up paying a fine. I had made the mistake of parking it in a “No Parking Zone” just because several others had parked their cars in the same area. I had tried to find comfort in simply following the herd and doing what they did. All our cars got towed. Sometimes I should apply the same principles I use for investing, even when it comes to parking my car. Investing is a lot like life, and life is a lot like investing. It is really interesting how much we can learn from our own life, if we just look closer and observe what all is happening around us. Another interesting thing that happened was Chirag Khilosia, a fellow Happionaire, shared details about a very interesting website called www.kiva.org which helps entrepreneurs with micro-finance. I checked out their website and their projects did seem interesting. However, I was unable to find any project which helps small entrepreneurs in India on Kiva.org. What do you’ll think? Is this a good model to help small entrepreneurs in India? Should somebody be starting something like this? We do have micro-finance organisations in India, but nothing of this sort which uses the internet to raise and disperse funds. I have also decided to let more Happionaires be heard, and from now on I am inviting guest writers for The Happionaire Blog who can share their ideas and thoughts with others. There aren’t any guidelines; however the posts should be related to all other Happionaires here. If you have something to share with other Happionaires just send me an e-mail at yogeshchabria@happionaire.com and if we think it is interesting we shall put it up on our blog. Several times people ask me if I trade with a small part of my capital. I just had somebody asking me that yesterday. Personally I don’t trade as I don’t understand it well, but I have allocated around 10%-15% of my capital for trading. I have somebody who understands technicals well trade for me. I feel very few people can manage to trade and invest successfully at the same time, as the mindset is very different. Rakesh Jhunjhunwala is one of the few rare examples who trades as well as invests. I shall share more on this later. Have a great week ahead and continue spreading the love, peace and happiness! Did you make somebody smile? You are correct. I remember your chapter on Car Parkings from ITHW. Not following the herd is what wise people do. Very interesting website Kiva. I checked it out, it is a great concept and I feel we surely need this here too. I'm curious to know about Vivek. lol ...did he get his copy of ITHW? I loved the superior quality paper and the hard cover, besides the excellent book. It makes a great book to keep around the house and looks very chic. Looking forward to more books under The Happionaire series. It has a bright future ahead! Similar to kiva, we also have in India http://www.nenonline.org . A not-for-profit initiative of the Wadhwani Foundation, working to inspire, educate and support the next generation of high-growth entrepreneurs in India. Yes, Aditya i finally managed to get my hands on the book, thanks to Yogesh for all his efforts in that. and passed on my appreciation and comments about it to Yogesh also. Indian writing is going through a revolution with new writers like Yogesh changing how everything works. 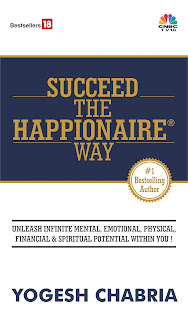 I just checked and saw that Invest The Happionaire Way was on number two of the bestseller list, beating almost all bigger names. It is nice to see this happening. Sonu are you working with the Wadhwani foundation? I think i was right this book is very soon going to be no:1 in the best seller list,best of luck for the success of the book keep smiling and be happionaire for the life! Thanks Sonu for sharing about www.nenonline.org , have you had any personal experience with them? Thanks Mohit for the good wishes and it is great to see you here. Hope to see all of you soon!